Are you a personal trainer or strength and conditioning coach looking to dramatically grow yourself and your business this year? The Elite Mentoring is here, apply today. Start your journey to becoming fully booked by filling out the application form NOW. Let me take you back to the 15th July 2005. I was a passionate, ambitious strength and conditioning coach and the world was my oyster. At the time all I wanted to do was build and launch my own performance gym very much like the ones you see in the states from people like Joe DeFranco and Mike Boyle. I’d managed to negotiate an agreement with Leeds City Council to rent space at the South Leeds Stadium and train people from there. I had my website built, banners and flyers made, and invested in several thousand pounds worth of high-quality equipment such as squat racks, barbells, hurdles and more. I honestly thought I knew exactly what I was doing and it was a matter of time before the place was stacked full of people. I literally had 1 person sign up in the first 2 months and I lost a ton of cash trying to make it work. When I look back on this experience almost 13 years ago it’s really clear to me what went wrong. The reality was that I had no real clue how to market my business to attract the type of clients I wanted to work with. It’s that simple. No one knew who I was and what they would get from working with me. As much as it hurt back then I was determined to get it right and achieve my dream. I went to the states to learn from people like Mike Boyle who at the time had the top gym in the entire USA. I continued to improve my coaching and methods of training people to achieve exceptional results.But more than anything I embraced online marketing and the principles of business so I wouldn’t make that mistake again. Over the next 5 years I set myself up again, rebranded, built my reputation and by the time I was 27 I had that gym training Olympic and elite athletes alongside the general public. We had around 300 athletes per week of all shapes and sizes from UFC fighters to elite netballers, weightlifters, triathletes and more. But we also were delivering 140 sessions of personal training per week in an exclusive high quality environment with 9 full time coaches on board and many interns coming through who have gone on to achieve their own version of success. I went on to found Strength and Conditioning Education, The Youth Strength and Conditioning Association, and now Strength and Success and I attribute it all to embracing how to build a great business and working with mentors, coaches and consultants who helped me to get to where I am now as a CEO running multiple successful businesses. I created the Fully Booked 90 programme to help people like you to get that business education and mentoring so you don’t have to experience the pain that I did and instead you can grow your income exponentially and make the impact you’re looking to make all within a 90 day period. 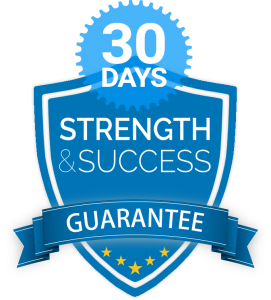 The programme is the last 13 years of my business career condensed into a 90 day programme that will absolutely give you the structure, confidence and mindset to be a huge success. This is a critical piece of the puzzle for us to establish. Even if you don’t know what you want as you read this, we will work on that together and make sure that. Once we know your mission we can work on the best possible route to get there and break down each step so you know exactly what you need to achieve on a daily, weekly and monthly basis. You’ll come away with a blueprint showing you exactly how to attract the clients you’re looking for and how to automate this so it works without any input from you whatsoever. Again we will have daily, weekly and monthly actions detailed so you know what to do to make your venture a huge success. Charging high fees means you need to be seen as the expert. I’ll show you exactly how publications such as Mens Health, Mens Fitness, GQ, the Indenpendant and more have featured my work and how to use this to grow your personal and business brand. Each and every one of us have unique challenges that we need to identify and overcome to unlock the potential within us. We will work together to identify your limiting beliefs and figure out a clear route to overcoming them.I always say to people that the quickest way to grow your business is to grow yourself first. Once you are thinking like a successful business owner you will undoubtedly become one! You have to put everything into action and I’ll be with you every step of the way to make sure this happens. If this programme sounds like it may work for you the next stage is to fill out an application form by clicking the link below. We will then schedule a time to talk through the programme and discuss the different options available. There are number of different options we can work from online to face to face and a blend of both of these. Once you have applied for your space we can discuss this on the phone to make sure the fit is right for both parties. This is for people who want to make a genuine impact with the work they do and generate an enviable income for themselves and their families. A fully booked coach with the right clients charging what their worth is a serious business person and this is who I am looking to work with on the programme. Why would you spend 10 years trying to get somewhere when you can do it in a few months. This programme is for people who recognise this and are prepared to invest in the right people to help them shortcut the journey. Nothing amazing happens without some serious work involved. If you are up for the challenge this may be right for you. If you want it easy then please do not apply. This is for people who realise that the next 90 days is not the end but the beginning. I am looking to work with people to grow their businesses in the long term. Although this is a 90 day programme and you’ll achieve great things, you need to realise that this is only the start of the process. You want success now and you’re ready to make it happen. If you’re not that’s fine. We have plenty of content and courses that will work for you just check out our blog and podcast for tons of free information. This programme is only right for you if you want to get started now or in the next month or two at the latest and you’re ready to secure your place. If you are the type of person who will never part with your money it’s not the right fit for you. Growing your business means trying new things, stepping into the unknown and having belief in your abilities to make it happen. Whilst I can absolutely help you with this if you’re not ready to invest in a coach or mentor I can’t help you I’m afraid. Again we have tons of free content that will help you, check out the blog and the podcast. No gimmicks or marketing I do not have much time available and I want to make sure that I put 110% into the people that I do work with and I can only do this if we are a great fit. With that in mind I am asking you to fill out a very quick application form to make sure that we are aligned before we speak further. There are a number of options available for the programme depending on how fast you want to go and how intensively we work which we can discuss on the application call. However to be clear the minimum level of investment for the programme is £1500. If this sounds like a lot of money put that into perspective of how much you could be earning at the end of the programme and for the rest of your career. Then think about how much you are not earning currently and what the cost of staying at that level for the rest of your career may be. If it still seems like a huge stretch then the programme is not for you and I would encourage you to not apply. Finally, as much as I love to work with everyone if you are just not in a financial position to find a minimum of £1500 I would suggest you take a look at my FBI (Fully Booked Incubator) programme as opposed to a mentoring programme. Having been around for a long time (yes I’m an old timer now!) I have the network and contacts to make things happen quickly for you in terms of building your projects, marketing and business planning. Whilst many guru’s out there have never built their own business I am still running mine and have been through the pain to reach the pleasure. I know how the sleepless nights feel and I know what the profits on the otherside feel like. We all get stuck sometimes and you need someone who is a visionary thinker to help you see what the other side could look like and how to get there. Growing a real business takes planning. I will give you the tolls and skills to do this and not just rely on hope to grow your business. 5.You want to build your confidence and mindset so you are rock solid and nothing can stop you. The person who is running a profitable business is someone who is able to overcome all challenges that are thrown at them. I’ll work with you to put your personal development plan into action. Many of my students have gone on to open their own facilities, start online coaching businesses and generally make huge strides forwards through the principles I teach on my Elite Mentoring programme.